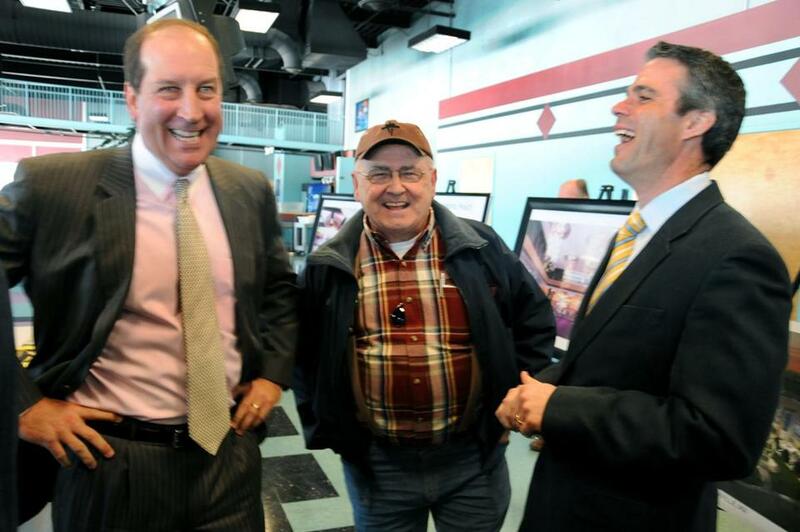 Penn CEO Timothy Wilmott (left), Jack Shepardson of Plainville, and Penn’s Eric Schippers spoke about the slots deal. Within minutes of officially snagging the state’s first gambling license Friday, Penn National Gaming vowed to vigorously fight efforts to repeal the state casino law, which opponents hope to put to a popular vote in November. Top executives from Penn, who have extensive experience with ballot campaigns, said Friday that they would launch a public campaign if a proposed repeal of the casino law qualifies for the ballot. The five-member state gambling commission on Friday formally awarded Penn the first license to be granted under the state casino law, after Penn officials confirmed the company would abide by conditions attached to the license. The unanimous vote came one day after the commission conditionally chose Penn’s $225 million slot proposal at Plainridge Racecourse in Plainville as the winning project over rival proposals in Leominster and at Raynham Park, the former dog track. Penn officials said they would soon announce a date for a groundbreaking. The company plans to open the facility next spring. Read: Coverage: Casinos in Mass. Whether state voters will have the opportunity to consider a repeal of the casino law is still an open question. Members of the Repeal the Casino Deal campaign are seeking a ruling from the Supreme Judicial Court to allow the question on the November ballot. The case is expected to be argued in May and a decision is expected this summer. Despite the uncertainty of the repeal, Penn officials said Friday they will pay the $25 million licensing fee, which is not refundable under current law. The fee must be paid within 30 days. Penn officials say they are confident that voters will keep the casino law if the matter goes to a statewide referendum. “We’re going to put 1,000 people on this [Plainridge] job to get this construction underway, so you’re going to have natural allies in the building trades,” said Schippers. He repeated an argument heard frequently on Beacon Hill when lawmakers passed the casino bill more than two years ago: Massachusetts residents are already gambling at casinos — they are just going out of state to do it. “It’s time to keep those dollars home, and that will be the common theme you will hear again and again throughout our campaign,” Schippers said. The company used a similar argument in Ohio in 2009, he said, to win a referendum that opened that state to the gambling industry. Casino repeal chairman John Ribeiro, in response, blasted the wealthy casino company for planning “to crush volunteer activists” that threaten casino profits. “Voters know we can do better than this, and we’re confident [that] Goliath, despite this big roar, can and will be taken down when the people have a right to vote,” Ribeiro said in a statement. Fresh off their victory, Penn officials on Friday posed with the gambling commission for pictures, and then went to Plainridge to celebrate with track workers and supporters. Penn chief executive Timothy Wilmott and his team walked into a raucous ovation from a crowd of horsemen, grooms, drivers, and other employees, who did not know until the commission voted Thursday whether they would keep their jobs. “This has been one heck of a week; my stomach was in knots,” Wilmott said. Penn’s win guarantees live harness racing will continue at the track. The 2014 season begins in April. It was a sentiment that echoed throughout the group. “We would have no other choice but to go to another state and find work,” said Richard Flanders, a race official. The mood was different at Raynham Park, where disappointed employees were trying to be as upbeat as track owner George Carney, 85. “In my style of living, things happen good one day, and not so good the next, and you just keep going,” Carney said. “The Gaming Commission treated me very, very respectfully. The fact that my application didn’t live up to the standards it should have, the only one that can be blamed for that is myself and my partners.” Carney had partnered in the slot venture with the company that owns Parx Casino of Pennsylvania. The bid earned no votes from gambling commissioners Thursday. Carney said he has no plans to close his simulcast betting parlor. Steven McGrath, a valet who has worked at Raynham Park for 10 years, said he watched the Web broadcast of the commission’s deliberations all week. 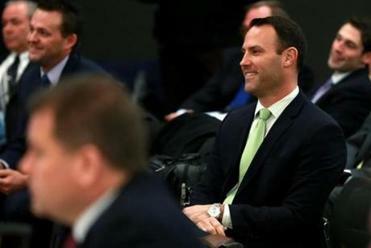 McGrath said that despite the disappointment, there was no booing or anger at the facility when the decision was announced.